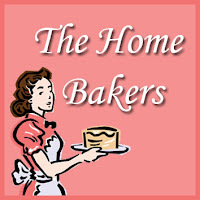 It’s my turn to host The Home Bakers! Can you believe how time flies? We are already on the 27th recipe, almost halfway there (total 30 recipes)! I’m sorry I wasn’t able to update the blog earlier, been really busy these few days, and all I want to do when I reach home is to shower and knock myself out on the bed. I was still editing the photos last night, nodding off in front of the computer as I crop the photos… haha! This is the 3rd pinwheel bread I’m posting for this year! And compared to the mini pinwheels I made (also for THB), these pinwheels are humongous! I had halved the recipe so I only got about 8 rolls in the end. The dough is really, really soft and sticky – so I added more flour and used my new hand mixer (hooray to new toy!) to knead the dough. You will probably have to flour quite a bit if you knead the dough by hand. Texture wise, the bread is really soft, fluffy and pillowy. The caramel sauce is to die for! I mopped up all the caramel drippings with the bread and it’s so good when the bread is warm. I had the bread for breakfast for the next couple of days – and I warmed it up by nuking it in the microwave for 15 seconds – I don’t know how the science works, but the bread became warm and soft again! But do take note that you have to serve the bread immediately after microwaving it as the bread will become tough after it has cooled down. As I am the host for this bake, I am allowed to post the full recipe! Yay! 🙂 I’ve inputted 2 lists of ingredients for the dough – one for using active dry yeast, the other for instant yeast. Do also take note that the steps are slightly different! 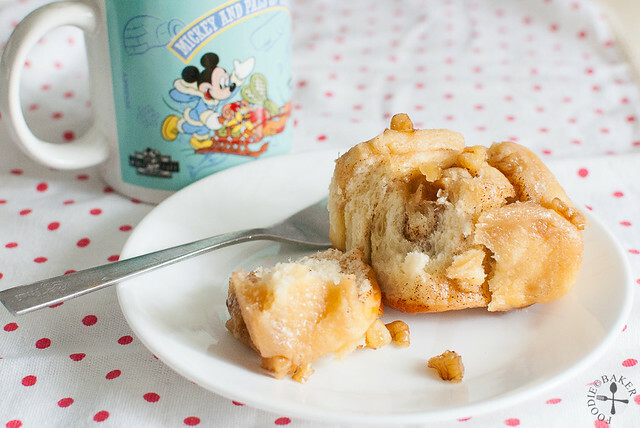 Before you click the link to see the recipe, do head over here to see the roundup! Sprinkle the yeast over warm water, add in the pinch of sugar and stir to dissolve. Let stand until foamy, about 10 minutes. Warm milk and butter together in a small pot until butter melts. Transfer to a mixing bowl and add in stir in the ⅓ cup sugar, salt and vanilla extract. Let cool until warm and stir in the yeast mixture. Mix in the eggs one at a time and beat until smooth. Beat in enough flour to form a soft dough. Warm milk and butter together in a small pot until butter melts. Transfer to a mixing bowl and add in stir in the sugar, salt and vanilla extract. Let cool until warm and stir in 1 cup of flour and the instant yeast. Mix in the eggs one at a time and beat until smooth. Beat in enough flour to form a soft dough. Kneading: Turn the dough out onto a floured table counter and knead the dough until smooth and elastic, flouring whenever necessary, about 8 to 10 minutes. 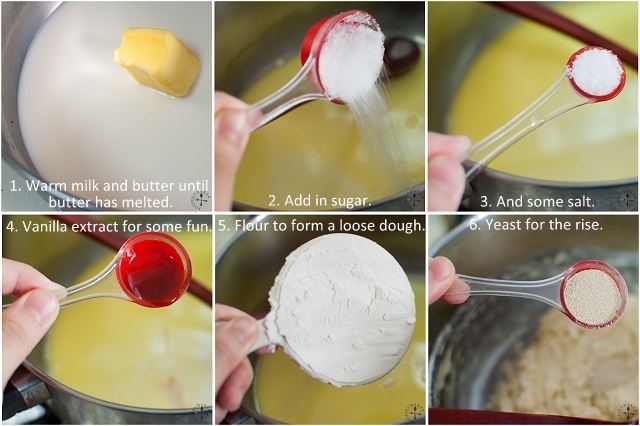 Alternatively, you can also knead it with your stand mixer. Transfer the dough into a buttered bowl, turn to coat and cover with plastic wrap or a damp tea towel. Let rise in a warm place until doubled in size, about 1½ hours. Caramel coating: Preheat the oven to 175 degrees Celsius. Lightly butter a 9 x 13-inch baking pan or a 14-inch pizza pan with a ½-inch rim. Place the butter, syrup and brown sugar in the pan. Heat in the oven, stirring once or twice, just until the butter melts and the mixture bubbles, 5 to 8 minutes. Spread the coating evenly over the bottom of the pan. Scatter the nuts over the coating. Let cool to room temperature. 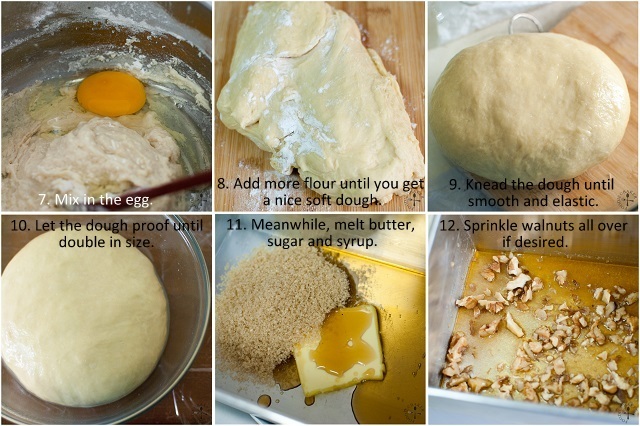 Filling: Punch down the dough and turn it out onto a lightly floured board and knead until smooth, 1 or 2 minutes. Roll into a 10 x 12-inch rectangle. Spread with the melted butter. Combine the brown sugar and cinnamon together in a small bowl and sprinkle evenly over the dough. Roll up from the long side and slice into ¾-inch-thick slices, about 16 slices. Place the slices, lying flat, ¾ inch apart in the caramel coated pan. Cover with a tea towel and let rise in a warm place until doubled in size, about 1 hour. Baking: Preheat the oven to 175 degrees Celsius. Bake the bread for 25 to 30 minutes, or until golden brown. Place a wire rack over a baking sheet to catch the caramel drippings. Turn the pan upside down onto the wire rack and lift the pan off. Let the rolls cool slightly and serve warm. hi jasline, going to bake these soon! Wonderful recipe, Jaseline, thanks for sharing! 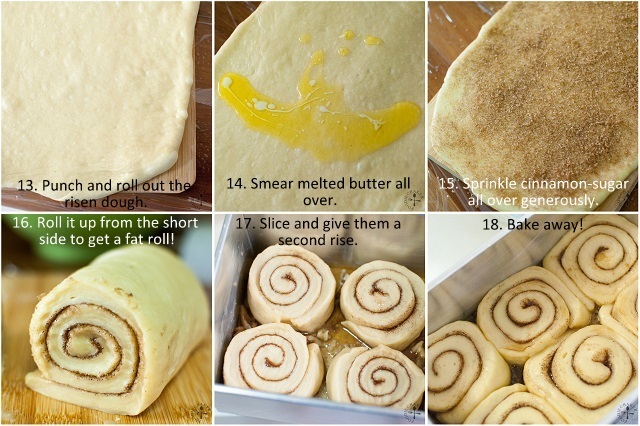 Jasline, your pinwheel bread looks absolutely gorgeous!! I hope to bake mine really soon, timing is ticking fast!! After a holiday the days that followed are always on the crazy side huh! 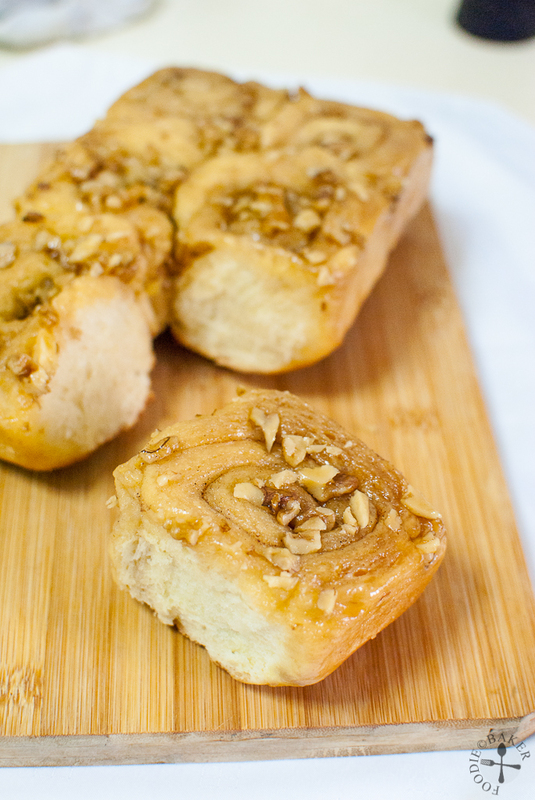 Love the look of this bread, the caramel certainly sounds delicious! This looks amazing and so far, I have not found time to make it. I hope I do find it because I want these. What a great choice by you. Thank you for the stepbystep pics! Gonna bake mine soon! Good morning, hope your holiday was excellent! These rolls are really so very good! We love it! I made it in the evening and everything was gone by the next afternoon! Texture is so fluffy and soft, a definite keeper recipe. Thanks for a great pick, will be posting mine tomorrow! These rolls look delicious! 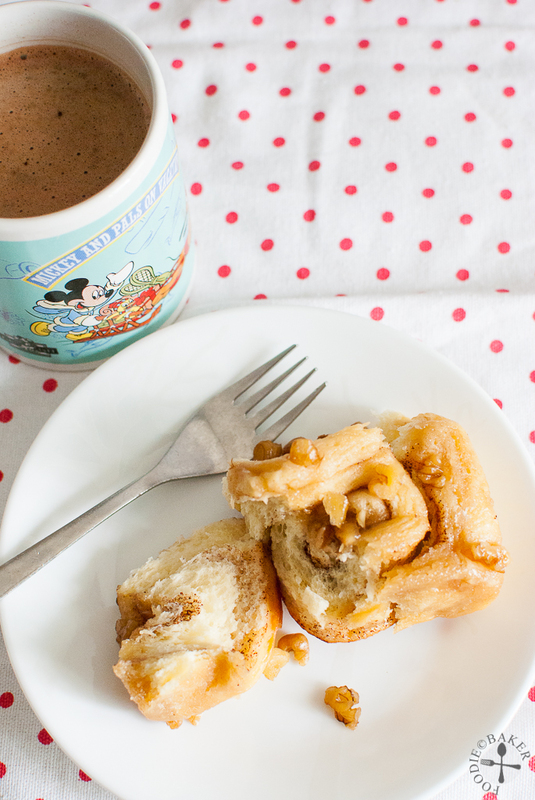 Perfect for breakfasts and Sunday brunch!